What is Chlorsig Eye Ointment (Chloriamphenicol) used for? 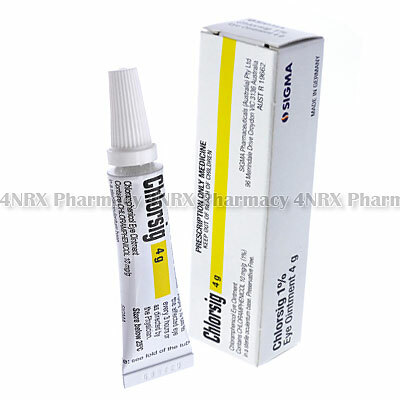 Chlorsig Eye Ointment (Chloramphenicol) is an ophthalmic medication prescribed to treat bacterial eye infections. The medication operates by destroying or preventing the reproduction of bacteria cells allowing the immune system to control or eliminate the infection. Your doctor may also prescribe its use for the treatment of other unlisted conditions. How should I use Chlorsig Eye Ointment (Chloriamphenicol)? Chlorsig Eye Ointment (Chloramphenicol) should always be used exactly as instructed by your doctor to ensure the most effective results. The typical dosage is one or two daily applications for a period of medication lasting one or two weeks. To administer the ointment gently pull down the lower lid of the eye being treated, apply a thin strip of medication to the pouch formed, and slowly close the eye to spread it over its surface. It is suggested to keep the eye closed for thirty seconds to allow the medication to be absorbed. Do not allow the tip of the medicine to contact any foreign surfaces, including the surface of the eye, as this may cause contamination. Do not stop using the medication before being instructed to do so, even if your symptoms seem to have disappeared, as the infection may not be gone and can return stronger or more resistant to treatment. Ask your doctor or pharmacist any questions you have regarding the medication to ensure the correct usage. What are the side effects of Chlorsig Eye Ointment (Chloriamphenicol)? Serious side effects that may require emergency medical attention include severe fatigue, sensitive skin, easier bruising, severe pain or stinging sensations, discharge, or crusting of the eye. Inform your doctor as soon as you experience any worrying symptoms to make sure the necessary adjustments are made to your dosage or application frequency to prevent more health problems from occurring. Chlorsig Eye Ointment (Chloramphenicol) should not be used to treat patients who are pregnant, breastfeeding, under the age of two, who have abnormal blood cell counts, or who have had a bad reaction to chloramphenicol in the past. You are also advised to inform your doctor of any other chronic health conditions you have that may cause unexpected complications requiring special adjustments to your regimen. Always remove your contact lenses before using this medicaiton. Strictly use Chlorsig Eye Ointment (Chloramphenicol) as prescribed and follow all instructions provided by your doctor. Safe, suitable, and optimum dosage can vary and is dependent on the patient`s health and medical history, as well as the condition you are treating. Chlorsig Eye Ointment (Chloramphenicol) may not be safe or suitable for all patients. Always ensure your doctor is informed if you are pregnant or breastfeeding, using any other type of medication (including non-prescription medicine, vitamins, and supplements), as well as if you have any allergies, other illnesses, or pre-existing medication conditions.